What does EA Tool mean? The last ten years a new software tool has made his way into our organizations. First only at a few, now almost every large to medium enterprise (LME) has an EA Tool on his premises to create and manage enterprise architecture. But let us define EA Tool and why do organizations have an EA Tool? EA Tool stands for Enterprise Architecture Tool. An EA Tool is a software application, like Dragon1, with which one can administer, store, model, view, visualize and manage architecture, data and information on the entities of the enterprise. Often an EA Tool is a software application with which one can administer, store and manage data on the entities of the enterprise. Also, you can create models, view and visualizations like Entity Relationship Diagrams (ERD) of the entities, for instance, business process models and IT system models. And you can create reports and matrices of the models and views. PowerPoint, Visio, Excel and Word still are often used as EA Tool (in name only) by architects. Of course, you can create (visualize) models and define entities in these software applications, but you cannot enforce consistency or rules in models. After a period of changes, the architecture products created with these software products are hard to keep consistent and updated. This often leads to recreating documents from scratch and creating an archive of unused documents. Real EA Tools offer a repository in which an architect can define build blocks and help to keep models consistent. Then the architect can publish those building blocks for reuse by himself or others and create variations of models to explore different scenarios. Real EA Tools also offer reporting functionality for analysis of the impact of change and generating visualizations and documents. 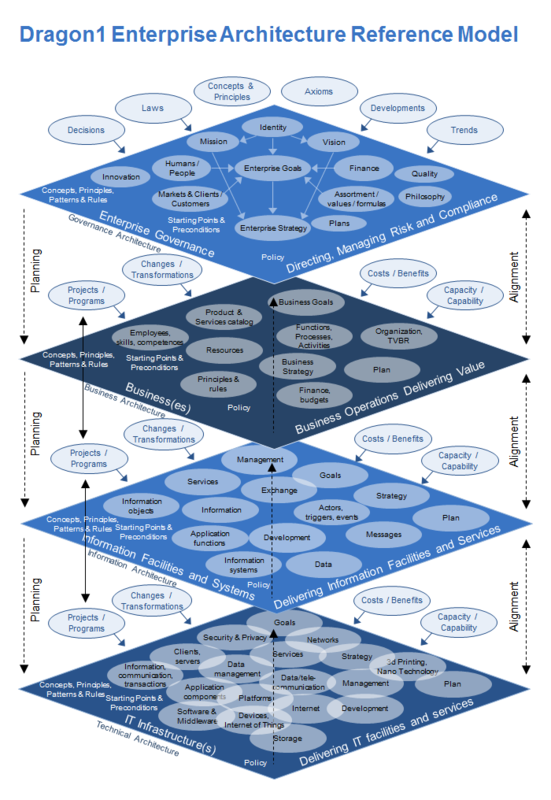 A typical Enterprise Architecture diagram consists of a coherent set of stakeholders, concerns, users, requirements, organizations, products, services, processes, information, applications, databases, interfaces, networks, servers, clients and locations. With EA Tools, like Dragon1 Innovation Lab, you can create these kinds of models or diagrams and use is to improve the coherence or alignment of the entities on it. This again will result in complexity reduction, standardization, vendor independency, cost reduction and the increase of adaptivity. 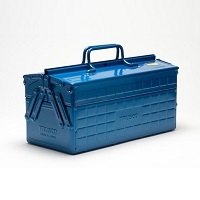 A symbol often used for EA Tool is: a toolbox. Here we have a page about everything a CIO needs to know about an EA Tool. Do you want to create an Architecture Diagram yourself? Sign up today for a Trial Account. On the Dragon1 platform templates are available to be more productive creating diagrams.